GOMA, Democratic Republic of Congo — The mutiny instigated by Bosco Ntaganda of mostly ex-CNDP officers in early April died down relatively quickly across North and South Kivu, with most defectors turning themselves in or being arrested—except for in the Masisi territory. Masisi has long been the stronghold of the ex-CNDP, where Bosco’s allies have had control through commanding positions in the Amani Leo operations. Soon after the rebellion started, Bosco himself retreated to his sanctuary in Masisi and his firm loyalists, who have temporarily flirted with the idea of redeploying elsewhere, are now back in the territory as well. Likely in the hope of weakening the parallel command enjoyed by Bosco and his affiliates, Kabila has started to reassign ex-CNDP officers to new posts away from their strongholds. However, his attempt to redeploy Bosco’s loyalists out of Masisi has failed so far. Col. Baudouin, one of Bosco’s closest allies, who left Goma, where he had signed his redeployment papers, returned to Masisi instead of taking up his new assignment in South Kivu. He forced his way back to Masisi through a road barrier held by government troops, taking with him his troops, trucks, and $40,000 he received for his redeployment. He reportedly distributed part of the money to his troops, boosting their motivation to continue the rebellion. Col. Innocent Kabundi, a government loyalist, who had earlier arrived in Masisi to replace Col. Baudouin, had immediate fallouts with Bosco, who is said to have put a price on Kabundi’s head as he views him as an impediment to his mutiny plan. Similarly, Col. Innocent Zimulinda, another close ally of Bosco in Kitchanga/Masisi, who was in Goma for a hearing by the FARDC discipline commission, has refused to be deployed outside North Kivu. While having been relieved of his command of the 811th regiment, he went back to Kitchanga last Friday. 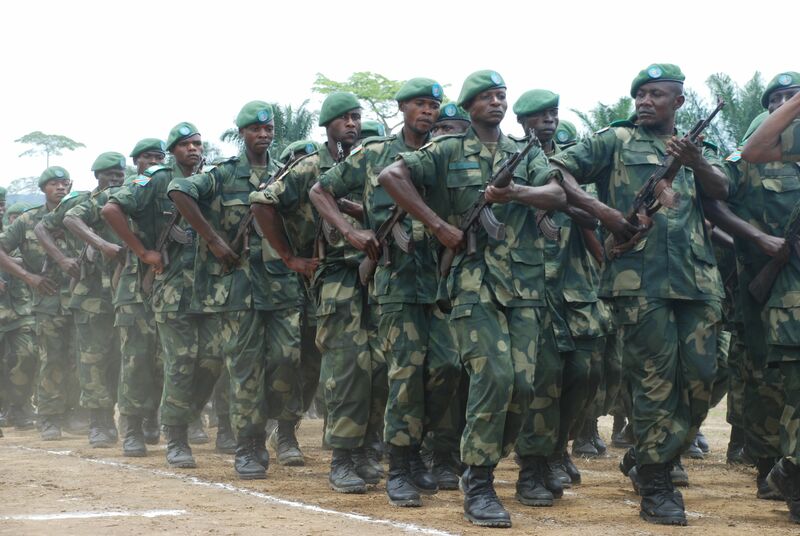 Out of the 1,000 of Zimulinda’s troops who did deploy to Kananga in Kasaï-Occidental province early this week only 50 were ex-CNDP, while the rest—an estimated 200 men—went to Kitchanga. The two colonels as well as Col. Butoni, a defecting commander from Ngungu who reportedly moved with his more than 400 men to Kitchanga a week ago as well, seem committed to Bosco and determined to go forward with the rebellion. Since early last week, ex-CNDP and government troops sent to the region have clashed in Bunyole, Rubaya, and Nyakajanga. Yesterday the fighting spread to Mweso, Mushaki, Ngungu, and Kitchanga as well. Sources indicated the ex-CNDP has the upper hand in the fighting, having the terrain home advantage and high motivation to win. Government troops based south of Masisi reportedly left for Bukavu late Sunday evening and are currently said to be in Minova, along the route from Goma to Bukavu. Other FARDC soldiers are said to have taken off their uniforms and have fled the scene as well—a move that has caused panic, triggering people to flee from Sake, a town just west of Goma that was already overwhelmed by displaced people from Mushaki, Matanda, and Karumba. Administrative sources in Sake told the Enough Project that around 30,000 civilians have been displaced so far, many of whom moved to Goma. While some arrived in the province’s capital today, others have crossed the Rwandan border to Gisenyi where a transit camp is reportedly being set up. While Bosco’s strength clearly lies in Masisi—intelligence services estimate his insurrection is now about 1,200 men strong—his influence still reaches other parts of the Kivus as well. A military convoy was ambushed April 22 in Binyampuli in Walikale territory, to the west of Masisi, killing the sector commander, Col. Chuma Balumisa, and Col. Kamatimba Pilipili. A third commander, Col. Manzi—an ex-CNDP, who was also part of the convoy and who is said to have sold out Col. Chuma—quickly stepped out of the vehicle and survived the attack unharmed. Allegedly, Bosco has orchestrated the incident with the help of Mayi-Mayi rebel leader Sheka. Apparently, both Chuma and Pilipili had spoken out against the mutiny, urging defectors to return to the army. They were especially opposed to the move by 300 or so ex-CNDP defectors to join rebel leader Sheka, a collaborator of Bosco as well. Bosco and Sheka have long collaborated in the illicit exploitation of minerals. Since late last year, they also joined forces to fight the FDLR and, more recently, government loyalists as well. With weapons supplied by Bosco, Sheka has inflicted heavy losses on the FARDC since mid-April and has taken control of several villages in Walikale territory, including Chobo, Lubonga, Ndurume, Kitika, Nsinda, Kasuka, Luvungi, and Brazza, effectively cutting off the Goma-Walikale road. Chuma had planned several offensives against Sheka’s forces and had decided to go to the front line as the commander of the troops, taking Pilipili along with him. On their way back from Kashebere, another village that had fallen under the Bosco/Sheka coalition, they succumbed to the ambush by Sheka near Binyampuli, FARDC spokesman Col. Sylvain Ekenge told the Enough Project. Clearly, Bosco’s rebellion is still gathering steam. While his grand mutiny across both Kivus seems to have failed, the rebellion is engulfing Masisi in full-out war, and Bosco still has the capacity to neutralize, or even eliminate, opponents outside Masisi as well.